You have probably been browsing the website for a while and naturally you have questions in your mind. If you are in marketing or wish to be, and if your organisation relies on marketing, this course is ideal… as it will give you the right knowledge to take you anywhere. 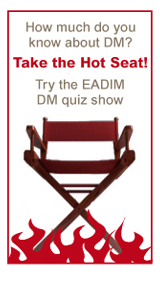 Just Click here to know more about EADIM’s First Certificate in Direct and Interactive Marketing. This course was created for everybody wishing to advance their careers and to learn more about direct and interactive marketing. It is equally relevant to anyone who realises that marketing offers a great future, and wishes to change careers. It is also important to organisations who appreciate that the real key to success is a good idea plus good people - and that trained people are better people. Whether you are an independent student keen on D&IM, an enthusiastic entrepreneur or a large organisation looking for good training for your staff, you have come to the right place.Book now and guarantee your seat! There is nothing quite like this certificate course available anywhere in Europe. It’s the only course designed for Europe as a whole and where you’ll learn from internationally recognised teachers, meet business people from all over Europe and be in touch with big players in the industry. Get more information about the teachers here. However much we like to welcome everybody, we can only accept people who have a university degree or equivalent or have worked in marketing for at least one year and have good working knowledge of English. You will understand that these requirements are essential to maintaining the high level of the course. If you want to know more about the course, please click here. Are you qualified? Book now and save €500! We tried to build a website that would answer nearly all of them after just a few clicks and that’s why this page was created. However, it’s always hard to imagine what other people have in mind so in case we missed something that you would still like to know, please send us an e-mail – we will reply.